The only fully functional bipod designed for precision shooting built into a vertical foregrip. Gen 2 T-Pod with spring-loaded swivel feature and pressure switch mount. Bipod allows weapon to rotate approximately 45º left or right of center for easily switching targets or tracking moving targets. Built for designated marksmen and those operating in urban settings who need to transition from close fighting to precision shooting. Issued to Israeli Special Forces and many US military units. Second generation T-POD with improved operation. Single thumb button releases legs. 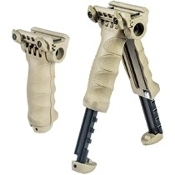 Closing halves and pressing legs up returns T-POD G2 to grip configuration. More compact than first generation T-PODs with a look that matches our AG-43 Pistol Grip and other accessories Quick-release mounting system. Aviation-grade Aluminum, steel, and MIL-SPEC reinforced polymer composite.